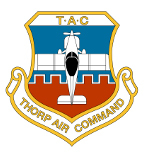 Thorp Air Command - T18.net • View topic - Aileron weight. Post subject: Re: Aileron weight. Those are questions with no answers. An aeroelesticity engineer would have to study the specific changes. I’m not one of those. I can tell you this.. the ailerons are not 100% balanced. You can prove this to yourself by disconnecting the push/pull from the mast. The Aileron will hang down even with the balance attached. I was told by Lyle Trusty that they somewhat rely on each other for balance. I’m not sure what that means. However, since they are about 2/3 balanced, any changes to the weight of the Aileron itself will take you into uncharted territory. What/where will the effect show up? That’s anybody’s guess. The ailerons on my "Mini A-37" have a weight of 6 - 8 oz at the trailing edge when I disconnect the pushrod. It would be nice to know if that is reasonable before I expand the envelope - or test the parachute! What ever came of the balance weight molds Dean Cochran from Colorado had? I believe they were loaned out to someone and never returned ... I looked for them when Dean passed away. If Tony (Dean's son) reads this, maybe he can confirm for sure whether they are still with him or not. Next time I see him I'll try to ask. I have molds for the ailerons. The weights are a standard item. They are fabricated IAW plans. If the builder manufacturers the Aileron IAW Plans, it should be fine. So that's the question, several people are talking about modifying the aileron with things like trim tabs. If the weight is a "standard" size we should come up with a "standard" balance. That way the weight can be modified to account for any change in aileron CG. The T-18 doesn't have a history of flutter problems and we don't want to start any. The other crowd (starting with a V) have lost a couple due to flutter. It's a sneaky beast that doesn't give any warning and doesn't often give you a second chance. All true. I don’t know enough to comment. My race project has an Aileron trim tab that was designed by Lyle Trusty. I used his plans. Anything other than that, you are on your own. I accidentally took off with my canopy unlatched one time. Good luck opening it in flight. I have pull pins on the canopy rollers with cloth handles snapped to the frame. I'll give a full report if I ever have to eject. As for the aileron weighs, I strongly caution against making ANY modification to flight controls, especially anything that changes the weight of the control surface, unless you can perform a proper weight and balance and do the appropriate flight test analysis. Is there any guidance in the construction about control balancing? Sounds like you do not have plans. I would strongly suggest you get some. Bottom line is that the plans show desired max control deflection. They also show allowable balance weight. Beyond that, no.